Do I need to loose some words? 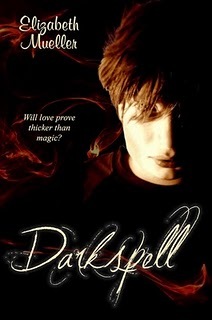 Darkspell by Elizabeth Mueller is released today! As part of that celebration I'm participating in the Darkspell Spookfesta. "If I had all the magic in the world, I'd . . ."
Now, here's a bit of a Teaser for Darkspell and reviews that have come in. Let me know what you think! The thought crossed my mind for world peace, which is true, but I didn't want to sound cliche. I've often thought how cool it would be to not have to stop for creature comforts so that I could accomplish my goals too! Hey there, visiting you from Elizabeth's site. I think you just want more time. And don't we all. I'd love to have all the time to do everything I wanted..that includes eating and sleeping. :) Happy Halloween. Oh, yes. That would be great! I'm visiting from Elizabeth's blog today. Happy Halloween! Ooh...I want to do that, too!